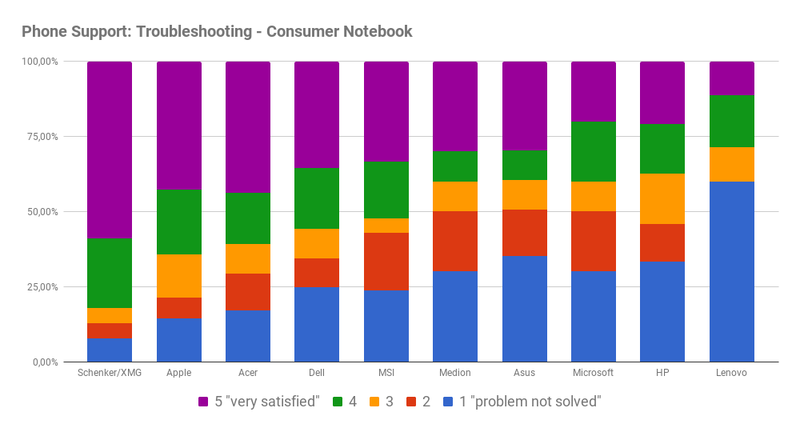 To find the notebook that is best suited for your individual requirements is one thing, but what happens when there are software or hardware problems? How good are the business services really? We asked our readers about their experiences with the service and support from their favorite manufacturers. Find out about the outcome of our survey with more than 1000 participants here. Update 25.04.2018: English Graphs added. 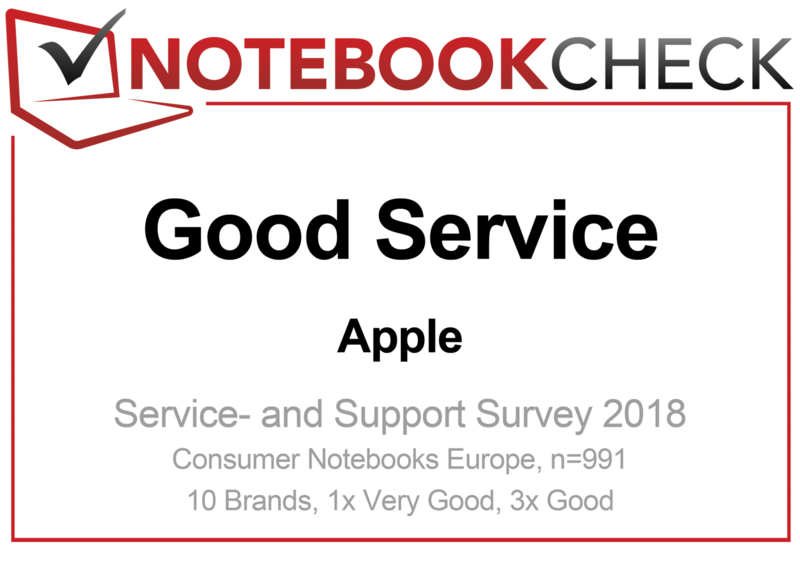 How satisfied are customers with the service and support in case of a problem with their notebook? We have been testing mobile hardware extensively for many years. Many thousands of notebooks and smartphones have gone through our test labs and the hands of our editors. Sometimes it also happened that a test unit gave us problems and we had to request a replacement device for our test. But what if exactly this happens to the end user? We often also receive requests from our readers who ask about the manufacturer with the best laptop service. Whether it is better to get a warranty extension or rather purchase a business notebook, which in general has a longer base warranty and many options on support expansion, are omnipresent considerations for notebook buyers. We see an objective "service test" as difficult to perform, since you would need to confront dozens of manufacturers with countless different, but yet standardized problems in order to get a solid basis of data. We therefore decided to ask our readers for their experiences with service and support. At the time of the analysis, we had almost 1400 filled out online questionnaires from Notebookcheck readers. The questionnaire was available on our websites in German and English and contained 13 questions in total. These were mainly multiple-choice questions with various answer options or ratings between 1 and 5 points. Participation was voluntary and there was no reward for participating. About three quarters of the participants stated that they were from Europe and of those, most were from Germany, Austria, or Switzerland. 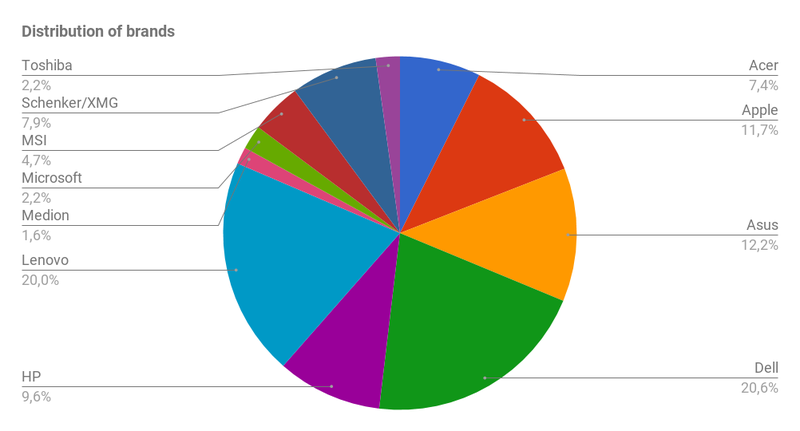 For the following analysis, we only evaluate the participants from Europe, taking a closer look at only the 10 manufacturers with the most participant responses, in order to be able to make statements based on the largest possible amount of data. The largest participant groups include Dell, Lenovo, Asus, Apple, HP, and Acer, which reflects their popularity on the German and EMEA market. Among other things, the participants were asked whether their notebook relevant in this survey belonged to the consumer or business category. While the percentage of business notebooks was particularly high for Dell, HP, and Lenovo users, manufacturers such as MSI, Acer, and Asus had almost exclusively participants of the consumer segment. 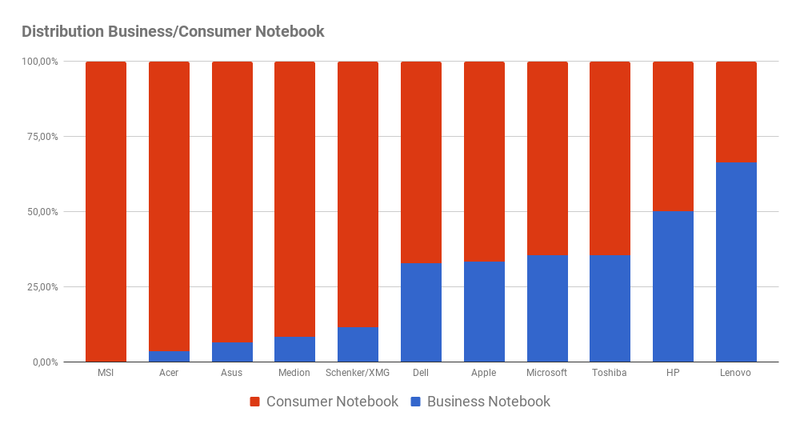 Interestingly, also about 30% of the Apple users stated that they were using a notebook of the business category, even though Apple does not offer any specific models here. Apple does not offer a specific business MacBook service. 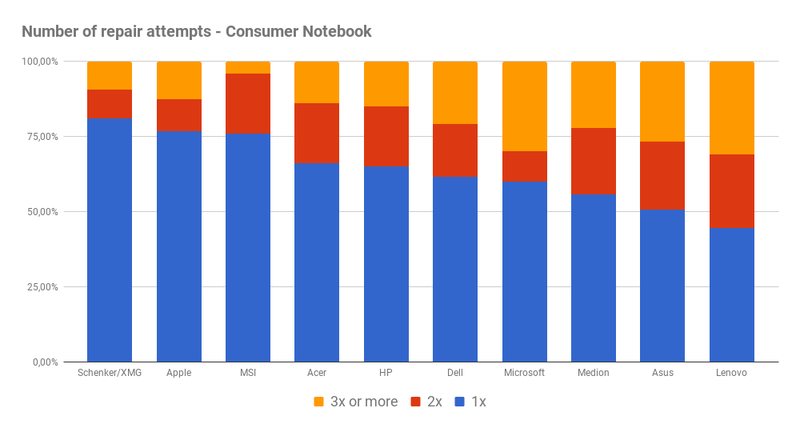 These customers would primarily be MacBook users who are using their notebooks mainly in the professional work environment. A particularly large percentage of Dell users decided for a warranty extension or service expansion. 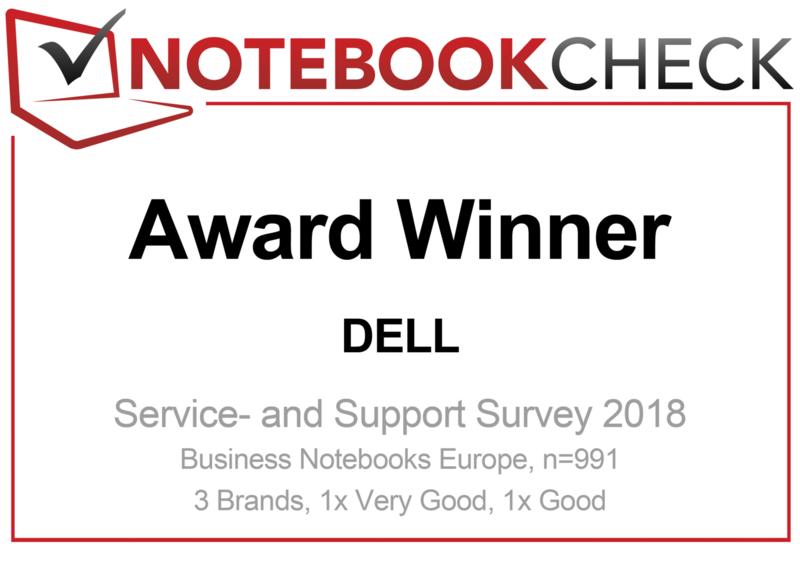 Among other things, this could be due to Dell's strong online distribution channel which offers an optional warranty extension and service expansion for practically any notebook. 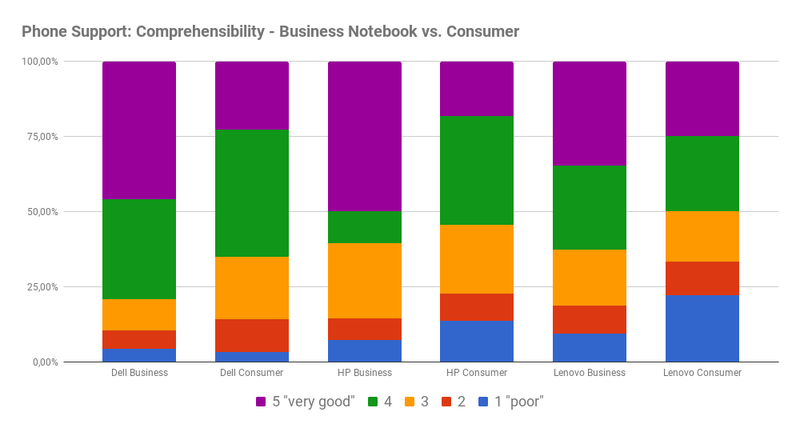 Users of established brands of business notebooks, such as for example Toshiba, Lenovo, and HP, tended to get a warranty or service expansion more often than those of brands with a lower percentage of business notebooks. One third of the Apple customers also stated that they purchased a corresponding expansion. Below, we would like to discuss the results of the separate questions in detail. We ask for your understanding that in order to provide an easily understandable overview, we limit ourselves to only analyze particular connections here. The complete data material is available at our editorial office. In case you are interested, you can contact us here. In case of a problem, the first contact with the manufacturer often occurs via a phone hotline that has been set up for this purpose. Here users of business notebooks often enjoy the privilege of having their own contact point for business partners. In our survey, we distinguish three assessment areas in the phone support: wait time, ease of understanding, and problem solving capabilities. Potential online support solutions, such as chats or FAQ databases that offer help to the users of mobile PCs were not included in this survey. Some manufacturers also allow you to initiate a repair via their website support, while you have to reach for the phone for others. 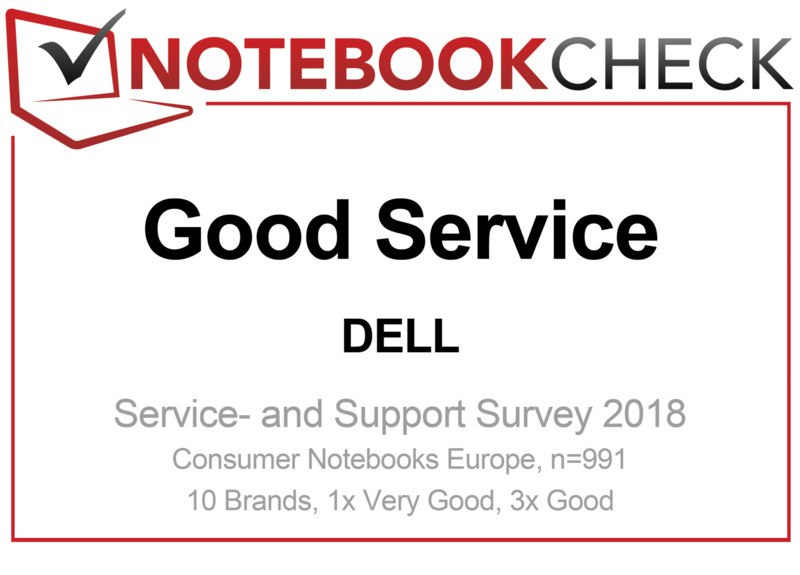 There is often an option to check your own service or warranty status via tools on the notebook or online form, for example using the Dell Service Tag, which can be found directly on the Dell notebooks. The first question in our survey asked the participants to rate the wait time of any phone support they might have used, giving it points from 1 ("very long") to 5 ("short"). According to this, the phone support of Schenker who has its seat in Leipzig, showed the fastest reaction among the consumer customers, receiving the highest percentage of the top ratings of 5 and 4 in the responses. About two thirds of the customers of Apple support were also very satisfied with the wait times (ratings 4 and 5). 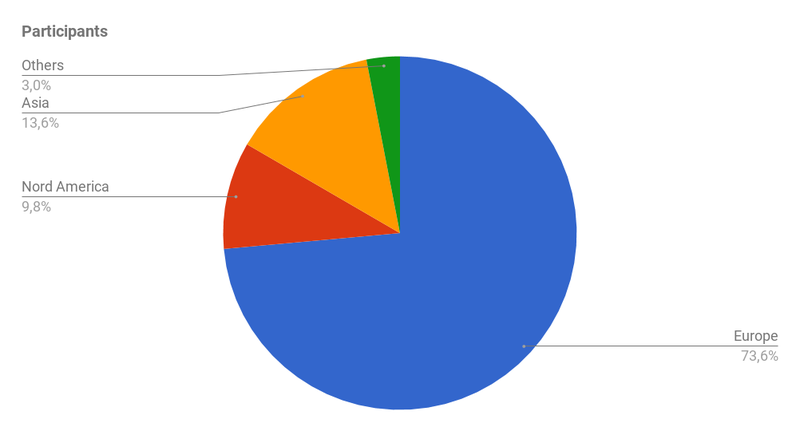 The Lenovo support, the HP-Support, as well as the Asus notebook phone service came in last (distribution diagram sorted by the average rating). As is well known, manufacturers maintain their own PC service departments for their business customers. In order to be able to visualize any possible advantages, we compare the three manufacturers with the highest percentages of business customers according to the responses in our survey among each other and also with their respective consumer support. 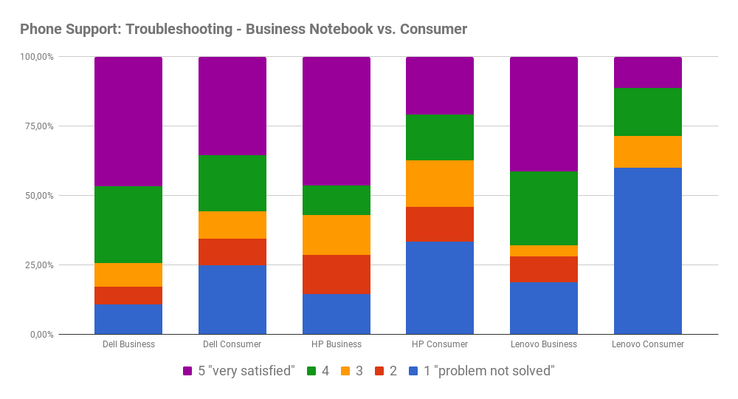 While the Dell phone support distinguishes itself by very short wait times for its business customers and the Dell consumer customers are also mostly satisfied, we can already see a more significant class difference with HP. This gap is extreme for Lenovo, where business users clearly have to wait less than the owners of Lenovo consumer notebooks. In the next point of our survey, the participants were asked to rate the ease of understanding of the phone service on a scale from 1 to 5, with 1 meaning hard to understand and 5, very easy to understand. 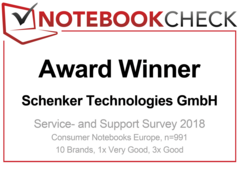 Here as well, the phone support from Schenker came out on top for the consumer notebooks, with more than 90% of the customers being very satisfied (ratings 4 and 5). Apple came in close behind with around 80%. In the group trailing them, you can find the Acer service as well as Dell and Medion, while the phone support of Asus, Lenovo, and Microsoft came in last and did not cover itself in glory in terms of ease of understanding. 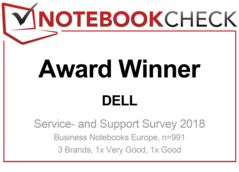 In terms of understandability, we can also attest a good rating to the Dell business customer phone support, while the consumer customers gave out the highest rating much less often. 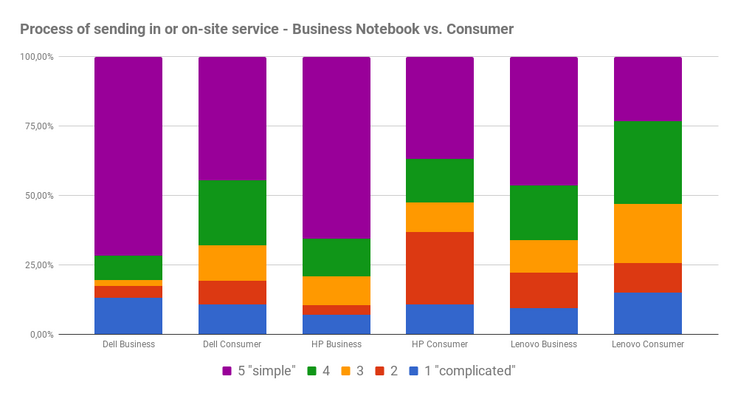 Lenovo's ThinkPad service also lags noticeably behind the Dell and HP business competitors. To get through to the right person quickly and then to be able to understand them well are good prerequisites, but how do things look with the problem solving capabilities of the phone support, which is the determining factor? The participants of our survey rated this from 1 point ("not solved") up to 5 points ("very satisfied"). Here as well, things look similar in the consumer laptops as in our comparison of the previous criteria. In terms of problem solving as well, Schenker is leading on the satisfaction scale ahead of Apple, Acer, and Dell. 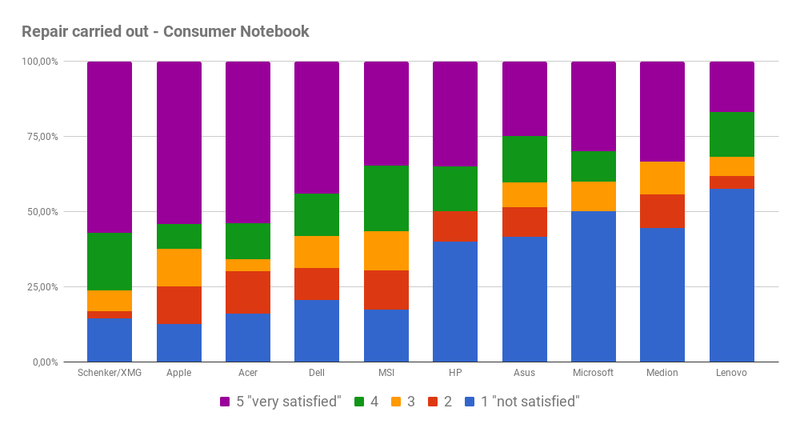 The hotlines of Medion, Asus, Microsoft, and HP come out last with about 50% of customers unsatisfied (ratings 1 and 2). The consumer hotline of Lenovo even plays in its own particularly low league in terms of problem solving capabilities. Of the business hotlines, Dell's again turns out particularly competent. 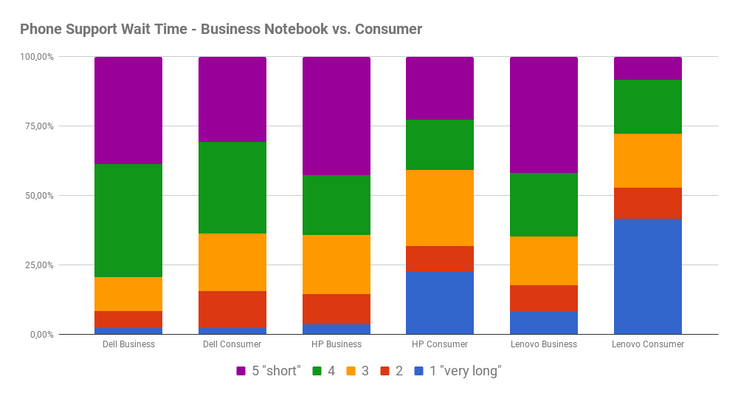 The gaping difference between business and consumer notebooks for HP and particularly for Lenovo is again quite noticeable. Whether a warranty extension is worth it for brand X is an omnipresent question for notebook buyers. The following diagram might help here. For the participants in our survey (consumer notebooks), the most defects during the warranty period occurred in the Medion, Lenovo, and MSI brands. However, we should note that for Medion, most of the devices sold by Aldi/Hofer have a three-year basic warranty, while MSI and Asus offer a manufacturer's warranty of 24 months. Apple shows the largest percentage of problems occurring during the warranty extension, followed closely by HP. None of the manufacturers stands out from the rest of the field in terms of the defects outside the warranty period. In order to compare the entries from participants that use a notebook of the business category with those who use a consumer product, we limit the choice of manufacturers to those three brands that collected the most entries in both categories. 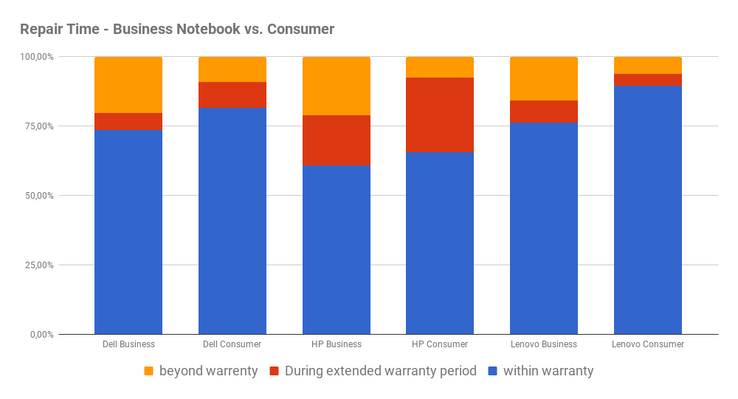 For Dell as well as HP and Lenovo, a defect tends to occur less often during the base warranty period in business notebooks. It is interesting that a higher percentage of HP devices, business as well as consumer, show a defect within the warranty extension period. 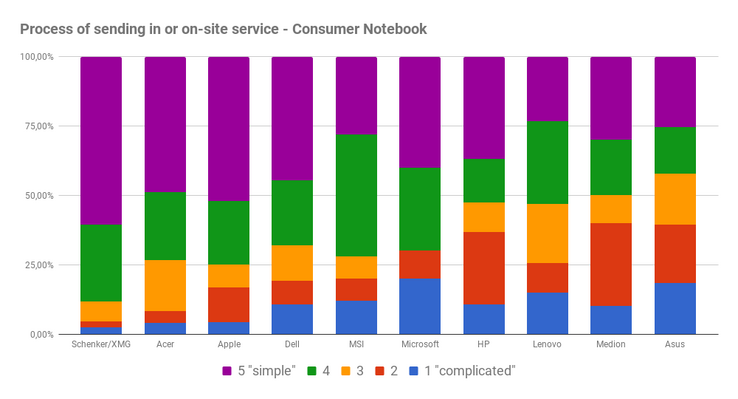 It also stands out that the percentage of defects outside a warranty, for which, according to our survey a service incident was created with the manufacturer, is higher in the notebooks labeled as business than in consumer laptops. This should be due to the often very long use of business laptops beyond the warranty period. The worst-case scenario has happened and the notebook needs to be repaired. This happens by either sending the computer (or with pick-up service), or on-site at the customer's base in case the corresponding service package was selected. We asked the participants about the difficulty of this process (consumer notebooks). The rating options went from "complicated" (1 point) to "simple" (5 points). A basic positive note is here that many manufacturers have up to about 75% of customers that are satisfied (5 and 4 points). Schenker again distinguishes itself at the top, while HP, Lenovo, Medion, and Asus remain clearly behind, having the least percentage of satisfied customers (only about 50% of 4 and 5 ratings) in terms of the process of sending the device for repair. We also want to draw a comparison between business and consumer customers here. Dell as well as HP and Lenovo show a higher satisfaction of business customers than regular customers. In terms of the expectations that are probably also higher there, this clearly speaks for a noticeable difference between notebooks of the business category that have the corresponding service contract and the run-of-the-mill consumer notebooks. Of the business customers, Dell users are the most satisfied with the repair process in comparison, with HP coming in closely behind. Lenovo's ThinkPad support lags far behind in this discipline as well. Repair Duration: Which PC service is the fastest? An essential factor in the service and support is the duration of a necessary PC repair. Particularly in the business area, where a tool for work has to be repaired as soon as possible and the time it cannot be used has to be kept to a minimum. But regular customers do not like to go without their notebooks for weeks either. 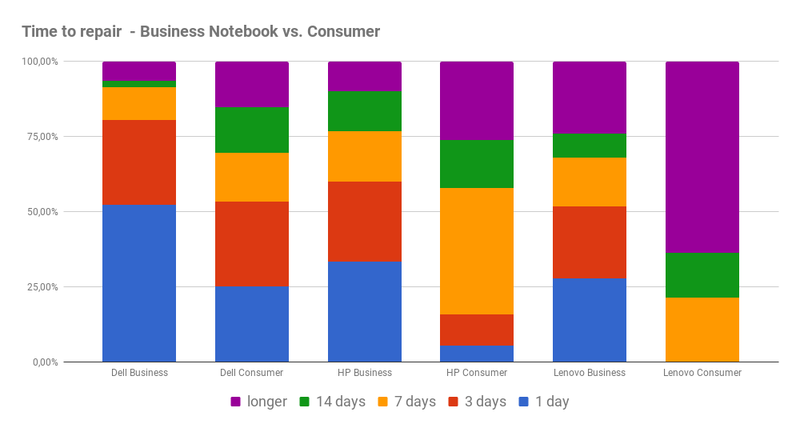 Dell appears to run a computer service system that is particularly effective here, since we observe the fastest turnaround times in our comparison of business notebooks as well as consumer notebooks. While about 50% of the business notebooks were repaired within one day and more than 75% within 3 days, also more than 50% of the Dell consumer notebooks could be used by their owners within 3 days. Far behind at the end of the scale were Asus and Lenovo, who needed up to 7-14 days or even longer for a computer repair in 60-75% of the cases. In the business segment, Dell can score with a repair duration of just one day in more than 50% of the cases, being far ahead of HP and Lenovo. Altogether, Lenovo disappoints in the business segment with a repair duration of more than 14 days in almost 25% of the cases. When the device comes back from the repair, the fault should be fixed and the customer satisfied. We also asked how much this is the case. 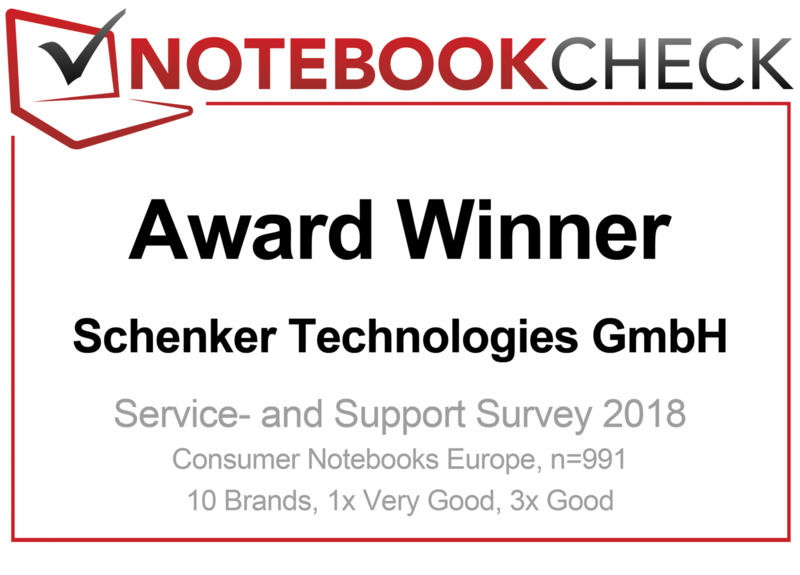 The highest satisfaction (5 - very satisfied) for consumer notebooks is shown by Schenker customers. Also those who are getting a notebook from Apple, an Acer laptop, or a mobile PC from Dell back from repair are rather satisfied to very satisfied. Dead last at the back of the field are HP, Asus, Lenovo, Medion, and Microsoft with up to 50% of the customers being only little satisfied or not satisfied (1 or 2 points). 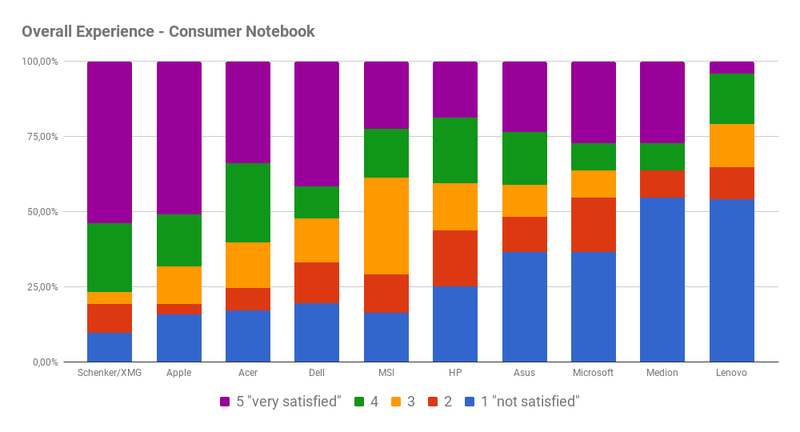 If you compare the experiences of business customers with those of the owners of consumer notebooks, as expected, we can see a significantly higher number of customers who are very satisfied with the repair of the business notebooks. In general, the satisfaction of Dell business customers and HP business customers is at about the same level, with Lenovo limping a little behind here. The Dell support and the HP service department have the least number of unsatisfied customers. Repair Attempts: One trial is often not enough! It can become particularly disappointing if one laptop repair is not enough and you have to send a PC back for repair again. Here as well, the manufacturers show a noticeable difference. 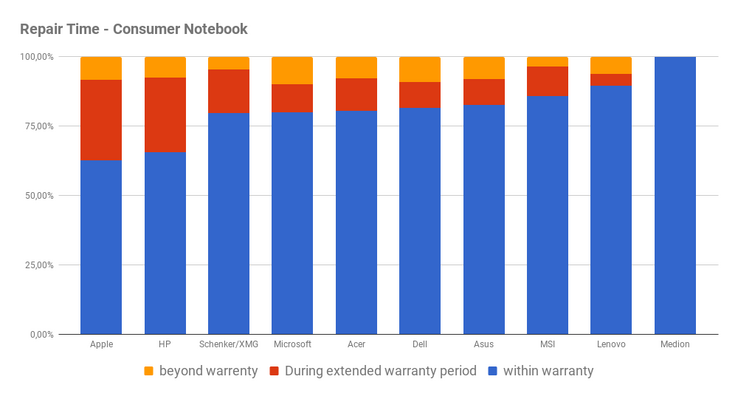 In the first attempt, Schenker, Apple, MSI, and Acer show the best results (about 75%), while Lenovo, Asus, and Medion were only able to perform about half the notebook repairs to the satisfaction of the customers at the first trial. Split into business and consumer notebooks, Dell and HP business notebooks are ahead in front. The computer support of Lenovo, which is only able to show a success rate of about 50% in the first repair for business notebooks as well as consumer laptops, falls visibly behind. 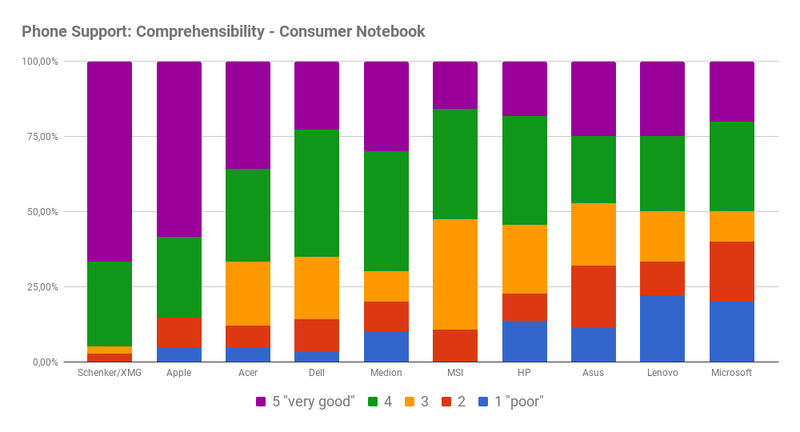 In conclusion, we asked the participants of our survey for their overall judgement on their experience with the service for a notebook from the respective manufacturer. The customers of Schenker and Apple were very satisfied, followed by the owners of an Acer and Dell laptops in the consumer notebooks. On the other hand, customers of Lenovo, Medion, and Microsoft products were to a large extent only little satisfied. If we take a look at the satisfaction with the service in the direct comparison between business and consumer notebooks, Dell shows much smaller differences than HP or even Lenovo. As we expected based on the preceding partial aspects, the business PC support from Dell tends to be more satisfactory than that from Lenovo. HP business customers are also mostly satisfied with the performance of the manufacturer in the service case. Verdict: Which manufacturer has the best notebook service after all? Whether it is phone support, repair duration or execution, the notebooks of the business segment turn out much better in terms of customer satisfaction than their counterparts from the consumer shelves. If you use your notebook as a daily workhorse, we absolutely recommend a product from the business segment or a device with the corresponding extensive and high-quality service. 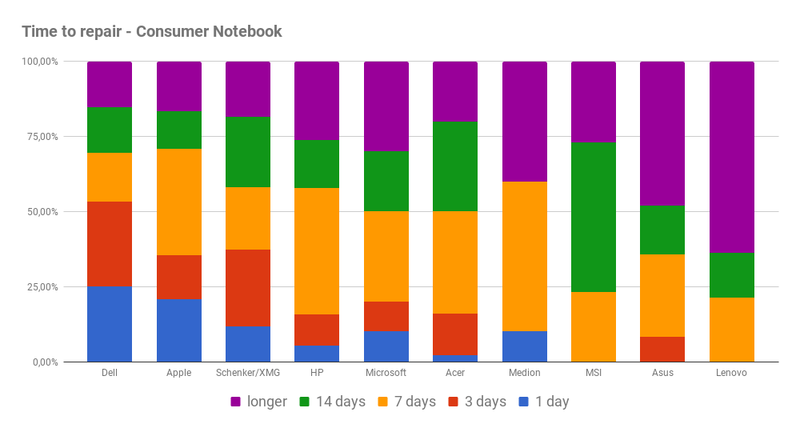 Although we saw that numerous manufacturers can also turn around PC repairs of consumer laptops within less than 7 days in many cases, the percentage of extreme lengthy repairs, up to 14 days or more, is considerably higher in consumer notebooks than in those of the business segment. A well-known brand name is no guarantee for first-class service. In the case of the group of consumer notebooks, a comparatively small manufacturer was able to positively surprise us. In many aspects, service cases with Schenker notebooks were resolved mostly to the satisfaction of the customers. The reason for this is probably the more efficient, smaller-scale structures, while larger manufacturers generally outsource to external service providers for IT services and call center. The well-known brands such as Apple, Dell, and Acer, who also earned a good performance rating from the survey participants in many aspects, are placed behind it. 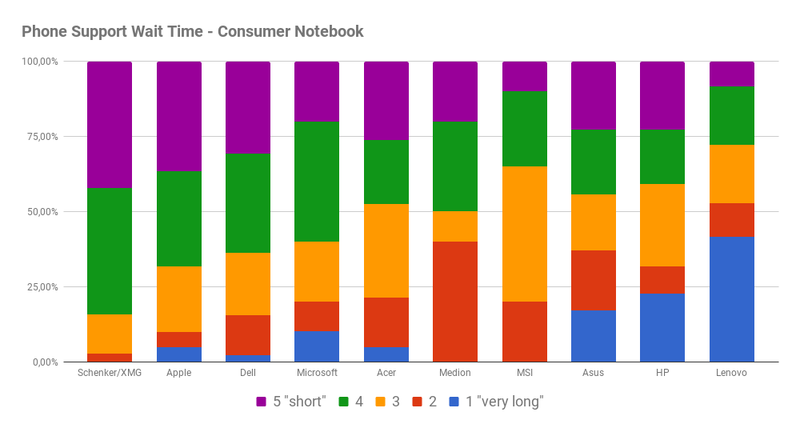 In contrast, Lenovo, Medion, Asus, and Microsoft always placed in the bottom range of the aspects we highlighted, and also the consumer notebook department from HP was comparatively unconvincing in terms of service. 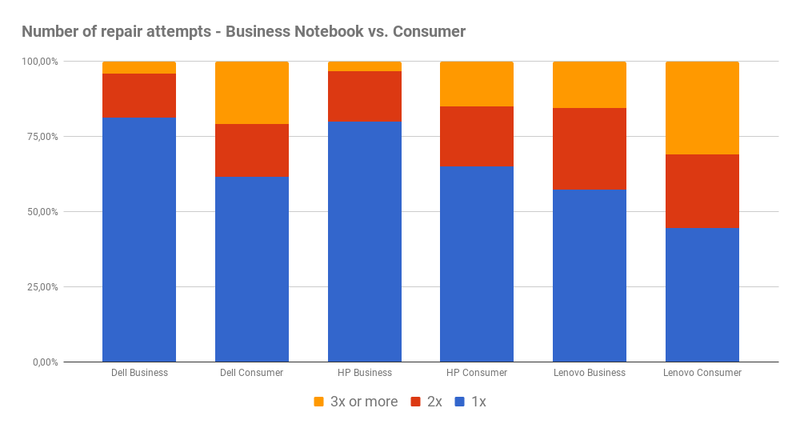 In the business notebooks, Dell has positioned itself at the top, followed closely by HP. According to our survey, the service structure of Lenovo business did have to shed some feathers. In any case, you should familiarize yourself well with the included service and support offerings before the purchase. If you are using a device for work, you should definitely look for on-site service, preferably with a response on the next business day. Looking at the numerous different service contracts, you can speak about a real jungle where it is almost impossible to keep an overview. For example, the warranty period is only one component, which does not say anything about the response time, repair turnaround time, and repair quality. We are constantly asking our Notebookcheck community about the current, exciting subjects via online surveys. Our website is available in 13 different language issues with a total of 12.5 Million readers per month (see Google Analytics, Unique Page Views as of January 2018; Link: further information and demographic data) with a high percentage of key opinion leaders in the area of mobile computing. We are happy to answer your questions on your individual market research (contact us). 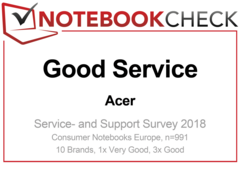 > Notebook / Laptop Reviews and News > Reviews > Notebook Service and Support Satisfaction Survey - Who has the best laptop service?